Unique Acrylic PaintingsThere are 7 products. Have you ever found yourself in the position of desperatly trying to find a special gift which is also handmade, unique and has special meaning? Have you ever thought of presenting brautiful, unique acrylic paintings, rich in vibrant colours, energy of love, blissfullness and beautiful motifs of animals and nature? 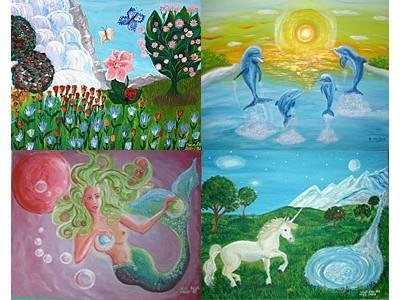 Original, handpainted acrylic paintings that I paint are a perfect gift for all who value special and meaningful gifts. I can also paint unique acrylic paintings by your request - for more info, contact me at info@unikatnica.com (Nina).